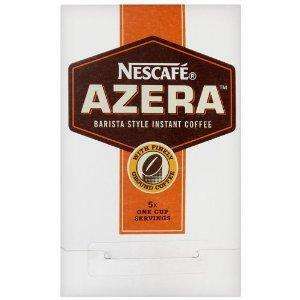 Nescafe Azera Barista Style instant and microground coffee mix. 5 sticks in a cardboard pouch. Just add hot water and milk as required. I'm using to make up food gift baskets. The Azera is the worst coffee I have ever had and I drink different coffee every week. The Azera is the worst coffee I have ever had and I drink different … The Azera is the worst coffee I have ever had and I drink different coffee every week. You should try Lavazza Italian Roast. You will need one of those pressers, brew for 5 minutes and you will love coffee for life.